Today, the Benjamin Franklin Silver Half Dollar Coin remembers when the Old Liberty Bell arrived in New Orleans for the World’s Industrial and Cotton Centennial Exposition on January 25, 1885. The Expo began in December 1884 in part to recognize the centennial of the first cotton shipped to England in 1784. The Cotton Centennial continued until June 1885 in New Orleans where nearly one-third of all cotton produced in the United States was handled and which was also home to the Cotton Exchange. Several books and periodicals from that era mentioned the movement of the Old Liberty Bell. Those who look with eagerness to the day when a reinvigorated national sentiment will so bind all parts of our country together that every sectional difference will be wiped out must view with satisfaction the effects of the recent journey of the Liberty Bell from Philadelphia to New Orleans. At every stopping-place in the South the people have poured forth to do homage to the precious relic, and have renewed at this fount the memory of the birth of our free institutions, and of the struggle by which they were maintained, and it has called up in the breasts of all thankfulness that the glorious record is still the common property of a common country. For the healthful state of the mind and heart of a nation there should be something around which the national pride and love of its people can cluster, and the South, in her reception of the Liberty Bell, has seized the opportunity to give word to her love of country, and to her appreciation of the sentiment with which this dear relic is sent to us. We feel that when we return it, it will be haunted, not only by the spirit of liberty, but by the spirit of brotherly love. R. P. T. Mourns, Ala., January 25, 1885. It has finally been determined to send the Liberty bell to New Orleans on January 25, all necessary arrangements with the railroad authorities having just been completed. It will go in a special train over the Pennsylvania railroad. The bell is to be in a special car, open at the sides, so that it can be seen along the route. In one end of this oar is a small compartment, which will be occupied by the three policemen who will protect it and remain by it night and day until it is returned. Attached to the train will be the other cars for the Special Committee of the City Council of Philadelphia that accompanies the bell. A pilot engine will run ahead of the train to insure its safety. The trip will be made via Louisville. Among the official incidents of the year 1885 was the pilgrimage of the bell and its safe return. On the 4th of December, 1884, I sent to Councils a message advising that the Liberty Bell should be sent South to New Orleans to the “World’s International and Cotton Centennial Exhibition” (continuing from December 1, 1884, until June 1, 1885) as a supreme object-lesson of patriotism, and an assurance of good will and fraternal fellowship to our brethren of the South. After much opposition to the removal of the bell, and the fear that it would never be returned, it was sent by authority of Councils in charge of a joint committee thereof, and under the special charge of three police officers, detailed by me from the regular force for that duty. In due time, in spite of all evil forebodings. the bell was returned in safety to its home-place, in old Independence Hall conveyed by the Mayor and Councils of New Orleans. 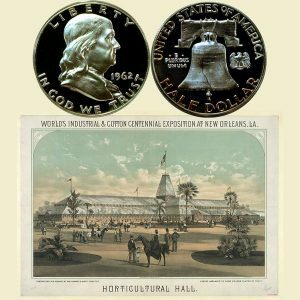 The Benjamin Franklin Silver Half Dollar Coin shows with one of the Cotton Centennial Exposition buildings in New Orleans, circa 1884.